This article is about the city. For the district, see Pabna District. Pabna (Bengali: পাবনা) is a city of Pabna District, Bangladesh and the administrative capital of eponymous Pabna District. It is on the north bank of the Padma river and has a population of about 190,392. According to the historian Radharaman Saha, Pabna is named after Paboni, a branch of the Ganges. Archeologist Cunningham wrote that the name came from "Poth", a totem folk who lived long ago in this region (Poundrabardhan). A survey map from 10 depicts a Mouza (medium-size village) named Padeh Pabna in the Nazirpur Pargana (pargana can be considered as a cluster of villages). Haraprasad Shastri, the author and historian, regarded the name Pabna as originating from Podubomba, a small feudal kingdom, which was established by a king named Shom, during the Pal Dynasty period. Historian Durgadas Lahiri, in his book Prithibir Itihash, used a map from the ancient period where a village named Pabna can be seen. A legend: There was a robber (like Robin Hood) named Pobana who lived here long ago. He became a legendary hero for his good deeds. People honoured him by giving his name to the river Pabna. The name comes from the Persian word "Panmbah", which means cotton. At one time, a number of inhabitants here were weavers. Pabna Municipality comprises a mayor and 15 councillors and 5 female councillors. Each councillor represents a ward of the town. All of them are elected by people's vote. Dhaka is about five hours by road, through the Jamuna Bridge. 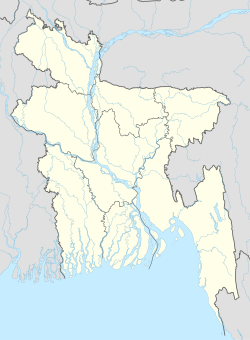 Cities and towns of Dhaka Division, Chittagong Division and Sylhet Division are connected though it. Kushtia District and other parts of Khulna Division and Barisal Division is connected through Lalon Shah Bridge. River crossing (ferry ghaat) at Nogorbari on the Jamuna River is the old route to Dhaka and the eastern part of Bangladesh. It takes three to four hours to cross only the Jamuna from Nogobari to Aaricha river port in Manikgonj District. Najirgonj river crossing on the Padma River connects Pabna city with neighbouring Rajbari District as well as Faridpur, Madaripur, Shariatpur and Gopalganj Districts, and Barisal Division. Pabna is well connected to all the districts and towns of Bangladesh by road. Pabna city has connected with a new railway network. Pabna Railway Station is in Shalgaria near Pabna Central Bus Terminal, opened 14 July 2018. A nearby railway station was in Tebunia, 10 kilometres (6.2 mi) from city center. The nearby airport is at Ishwardi Upazila. Biman Bangladesh Airlines used to operate twice-weekly services to Ishwardi from Hazrat Shahjalal International Airport, Dhaka. However, no airlines are operating to and from Ishwardi at the moment. Several Dhaka-bound private bus services are available such as Pabna Express, Shyamoli, Sarkar Travels, Raja Badsha, Badol, Mohanagar, C-line, Arif, Ishurdi Express, Night Star, Kings, Esha, Capital Service, Al-Hamra, Silver Line, etc. Government-owned Bangladesh Road Transport Corporation (BRTC) provides bus services to Rajshahi and Bogra city. Water transport is important, as the Padma and other rivers, and Chalan Beel wetland are in Pabna. In Pabna district, rides by Nosimon, rickshaw-van, and Korimon are pleasure worthy. Pabna has fledgeling knitted fabric and handloom related textile industries. There are consumer and pharmaceutical producing factories. Square Pharmaceuticals is the largest pharmaceutical company in Bangladesh. A majority of its factories are at Shalgaria near Jubilee Tank area of the town. Apan Store, Hazir hat, Pabna Sadar. Pabna has the largest mental hospital in Bangladesh. It also has a big general hospital, numerous medical centres, and small private clinics. Pabna Medical College and Hospital is under construction. In healthcare, Pabna Community Clinic, a division of Dhaka Community Clinic, established and led by Prof. Dr. Quazi Qumruzzaman, has made a great contribution in development and mitigation of arsenicosis. The nine Upazilas under Pabna District holds an upazila health complex each. Government doctors get appointment through Bangladesh Civil Service commission. A 250-bed government-owned general hospital is at Shaalgaariya and a 450-bed mental hospital is at Hemayetpur. Recently the government-owned Pabna Medical College has been set up near the mental hospital, Pabna premise. There is a mosque at Chatmohar Upzilla named Shahi Mosque which built by Masum Khan kabuli at 15th century. There is a rumour that the mosque built in one night. A Mughal-era mosque 'Varara Moshjid' (Bengali: ভাঁড়াড়া মসজিদ) is some 10 km southeast of the town. The remains of Hindu temple Jor Bangla (recently renovated) is in Jor Baangla Paara of the town. Jagannath Temple at Chatmohar Upazila is considered one of the most beautiful Hindu temples in northern Bangladesh. Amjad Hossain, MNA (Member of National Assembly of Pakistan), organiser of Liberation War of Bangladesh in 1971. General Joyanto Nath Chaudhuri OBE, former Chief of Army Staff of the Indian Army. Bsc in CSE, Masters of Engineering in Information Systems Security, Elected Councilor Bangladesh Computer Society(BCS). DELOWAR HOSSAIN SHAHJADA Ex- Student Leader of Bangladesh Students' League. Honours & Masters Dhaka University. ^ "Pabna in Encyclopædia Britannica". Britannica. ^ এক নজরে পাবনা [Pabna at a Glance]. Bangladesh National Portal (in Bengali). Retrieved 2 January 2015. ^ জেলার ইতিহাস [History of the District]. Bangladesh National Portal. ^ Rahman, Md. Motiur; Al Mamun, Mohammad Abdullah (December 2012). "Socio-economic Profile of Executives: A Study on Small Industries in Pabna and Bogra Districts" (PDF). Daffodil International University Journal of Business and Economics. 6 (1 & 2). Retrieved 2 January 2015. ^ "Educational Institutes of Pabna". Bangladesh National Portal. ^ "Organization Registry – Pabna Mental Hospital". Government of People's Republic of Bangladesh Ministry of Health and Family Welfare. ^ "Organization working on Arsenic Calamity in Bangladesh". UNDP. ^ জেলার ঐতিহ্য. pabna.gov.bd (in Bengali). ^ "Temple awaits repair for 400 years – Jagannath Temple chatmohar". The Daily Star. ^ Deepa Bandopadhyay. নারীর লেখা নারীর কথা. Archived from the original on 19 May 2015. This page was last edited on 8 April 2019, at 06:36 (UTC).